Jonah could have easily blamed the storm on the boat full of idol worshippers. Perhaps his presence on the boat was a mere accident, and the boat was destined for doom. No, Jonah said that responsibility is mine. Today, in the wake of the Doheny “Kosher” Meat scandal, it is also our responsibility. bought from the store, or eaten through of the many restaurants and caterers that sourced their meat there, consumed food that was potentially trief. Yet, let’s remember that the Prophet Jonah says, “it’s because of me.” We read this on Yom Kippur to remind us that we need to take responsibility, and need to do a soul searching. As it says in the Talmud, it is not the mouse that is the thief, it is the hole. https://i0.wp.com/rabbiyonah.com/wp-content/uploads/2013/03/blog_doheny_meat.jpg?fit=584%2C360&ssl=1 360 584 rabbiyonah http://rabbiyonah.com/wp-content/uploads/2013/04/cropped-RabbiYonahbookCover11.jpg rabbiyonah2013-03-29 12:49:092013-05-17 21:06:11Who is to Blame for the Doheny Meat Scandal? Here is the dilemma. You want to do a proper Seder, but you have anxious relatives, some tired kids, or need for whatever reason to get the Seder over and done with. It’s not ideal – but it happens all the time and people end up skipping essential parts of the Seder. With this in mind I created the 10 Minute Haggadah. This Haggadah is two pages long, can be easily photocopied, and was originally written to be used at a Shabbat Tent Seder. Everything that MUST be said or done at the Seder is included. In addition some favorites are included like Dayeinu. Even if you will use another Haggadah, check out the Ten Minute Seder! 1. What’s up with the matzah? 2. What’s the deal with horseradish? 3. What’s with the dipping of the herbs? 4. What’s this whole chilling at the table business? We were slaves in Egypt. God took us out with awesome miracles. Had God not taken us out of Egypt, then what? We, and our children, and grandchildren would still be slaves in Egypt! So, even if we were all great Torah scholars, we would still have to tell about the Exodus from Egypt. The more we talk about this the better – but God I’m short on time! The Torah reflects upon four types of kids: One Wise, One Evil, One Simple, and One Who Doesn’t Know How To Ask. GUIDE the wise one through the obligations of Passover. TELL the Evil One, we need you to be part of our people. EXPLAIN to the Simple One, “with a strong hand God brought us out of Egypt.” ENGAGE the one who doesn’t know how to ask, make that child feel comfortable, and tell them about the Exodus. 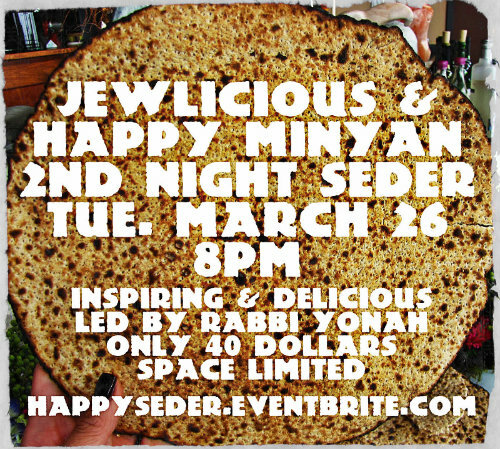 Our interactive, inspiring, and delicious seder is fully catered and creative. Bring your friends and enjoy this great evening. I will bring stories from Reb Shlomo, Hasidic masters, and other sources. Bring your own short Torah’s to share too if you want!